There are stages to Glee addiction. You can tell which stage you’re in by what song is stuck in your head. The first one, obviously, is “Don’t Stop Believin’.” After that, people veer off based on their particular interests. That’s the joy of an ensemble show: there’s something for everyone. And while it was stuck in my head, an image appeared in my imagination. I thought it would make a good t-shirt, but I don’t really make t-shirts (though I might, you never know.) I do, however, make cross-stitches, so I figured out how to make it. It took work. I had to find the right image, and put it into KPD’s computer, since he has design software, and then export it and send it to my computer, since I have MacStitch, and then I had to redo all the stitches a few times because first I had the colors wrong, and then the spacing and sizing of the letters, and then the image wasn’t clear where it was and I had to move it over, but in the end, I made the thing, and because of all that work, I’m super-proud of it! It’s hanging in my office. *I just have to add this. I thought that I probably had this idea while I was thinking about Season 2 obsessively. I thought it was right around when I figured out that “Candles” is really about Rachel, but “Raise Your Glass” is about Kurt and Blaine, particularly this line. After all, lots of people think that gay people are “wrong,” so Blaine is “wrong in all the right ways” as far as Kurt is concerned. (And as far as I am concerned.) Which is part of why the line resonates with me. I also think it kind of describes me and all the people I like best, which is why I want it hanging on my wall. But I was really pleased to find out, when I went to put the links into this post, that I was exactly right, and I have written proof, in the form of back-to-back blog posts. A cool side-effect of blogging. 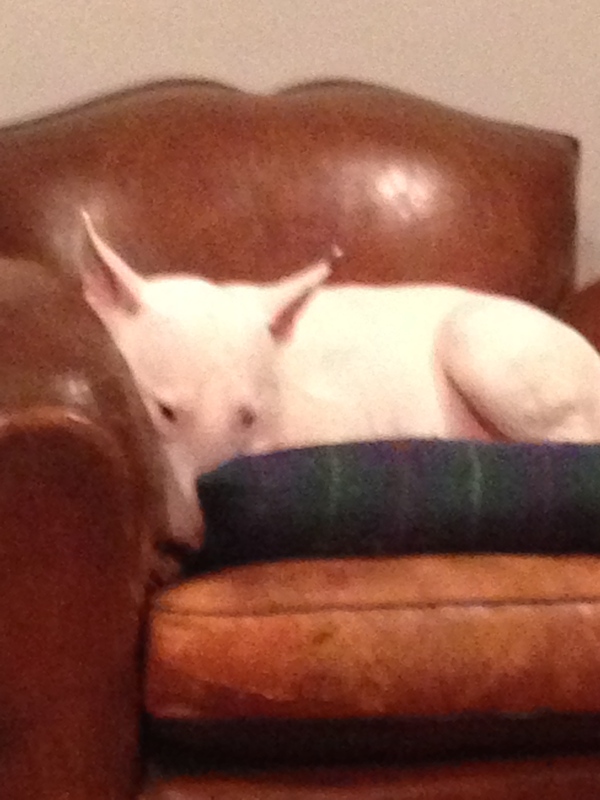 Harpo’s best friend is named Frenchie, but we often call her French Fry. I made her a present. It’s the latest in my dog series. I’m pretty proud of it. I designed it myself using clip art and MacStitch, and there are a lot of stitches in it, so it took a long time to complete. This morning, I got an idea for a cross stitch. It’s been a while since that happened. Okay, it’s Blaine-related. AND Warblers-related. So far, winter break has meant the same things for me as it does for everyone. Time with family–a Christmas party at my brother’s house–chores, errands, and relaxing. We’re dog sitting for friends, so we’ve had some lovely walks with the dogs. That’s right: I am simultaneously being a musical theater-, crafting-, Star Trek-, and dog-nerd. And that’s how it’s done. Back in February, I got an idea to make cross-stitches for my friends’ dogs, Arthur and Penny. 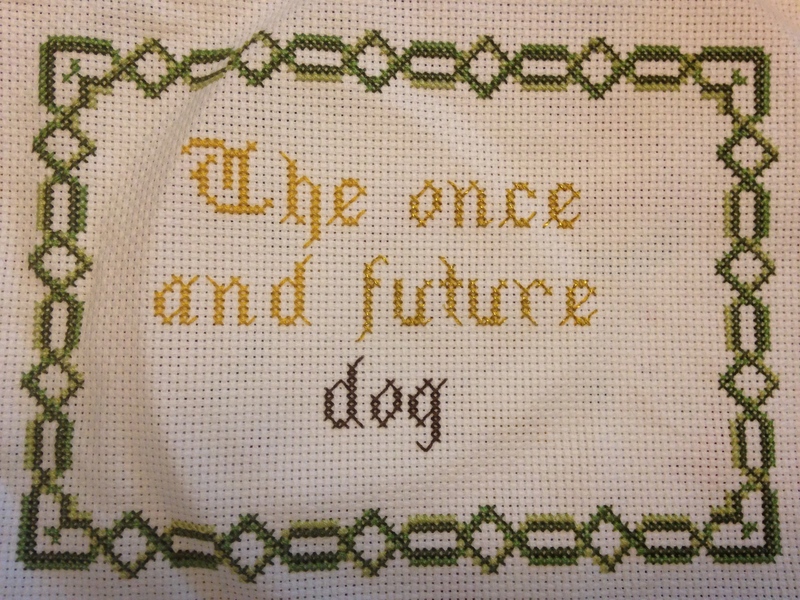 This got me started on what became a series of dog-inspired cross stitches. Our dog Harpo is named after the Marx Brother, but more specifically, he’s named after Harpo Marx’s autobiography, Harpo Speaks. 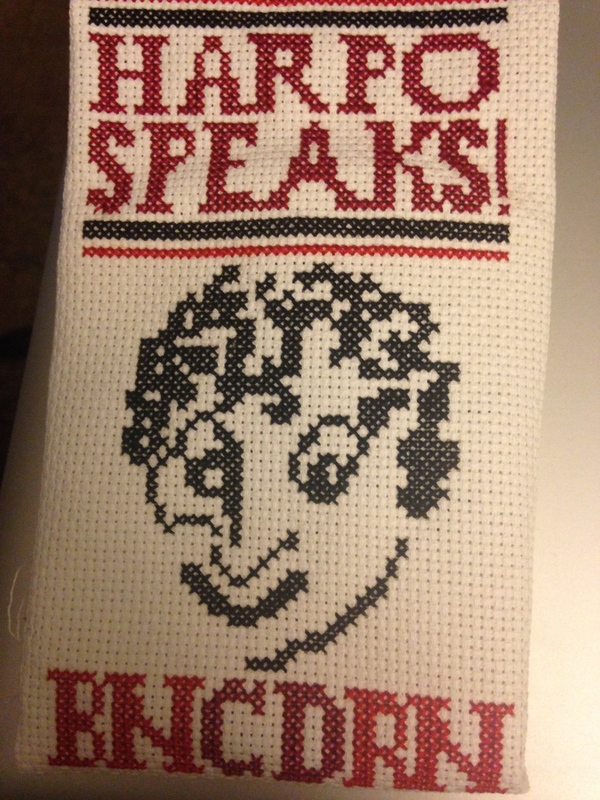 So I made a cross stitch of the book cover, with Harpo’s titles on the bottom instead of the author information. I was pleased with this one because I used a photo converter to make a pattern from a picture of the book cover that I found online. It was an experiment, and as you can see, it’s not perfect. The mouth came out a bit funny because the original picture shows Harpo unzipping his lips, and I simplified it. But on the whole I think I got the idea of the cover well and it’s a tribute to both Harpo Marx and our dog, Harpo. 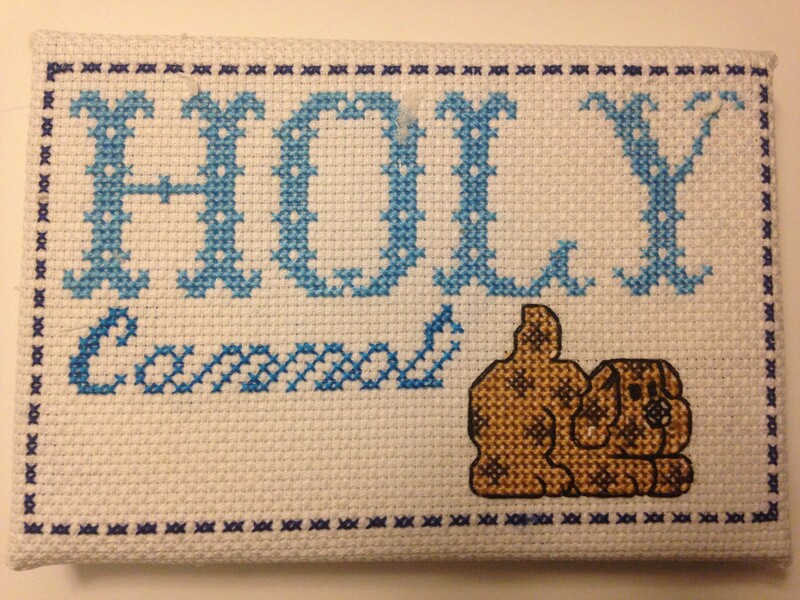 And I’ve just finished one for my friend’s new dog, Cannoli. This one was fun because I made it freehand, using patterns from several different books. Now I want to get a program so I can design patterns with more detail. I want to plan things that are a little bit more complex. 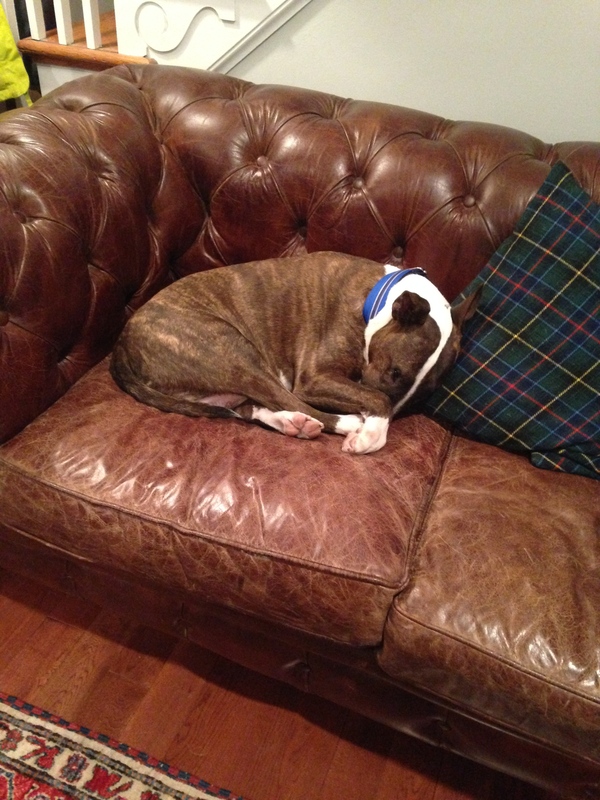 For more dogs that I know and love. If you’re a cross-stitch fan, you’ve been waiting for me to unveil my secret project. Fortunately, the secret project has arrived safely at its destination, so I can tell you all about it. Back in February, the Kid and I went to Washington, DC to visit my oldest friend in the world and her spouse. They have two awesome dogs named Arthur and Penny. I’m especially proud of these because I designed them myself using the online pattern maker at Crossstitch.com. After they were done, I mounted them on foam core and shipped them off to my friends. They say they’re going to have them framed and hang them over the dogs’ beds! Now I’m working on a cross stitch for Harpo, and my next two ideas also involve dogs, so it’s become a theme. Harpo’s project is about half-done, and I’ve hit a bit of a slump because I’ve been really tired this week. Hopefully I can pick up the pace a bit over the weekend and get it done before we go to Vermont next week. 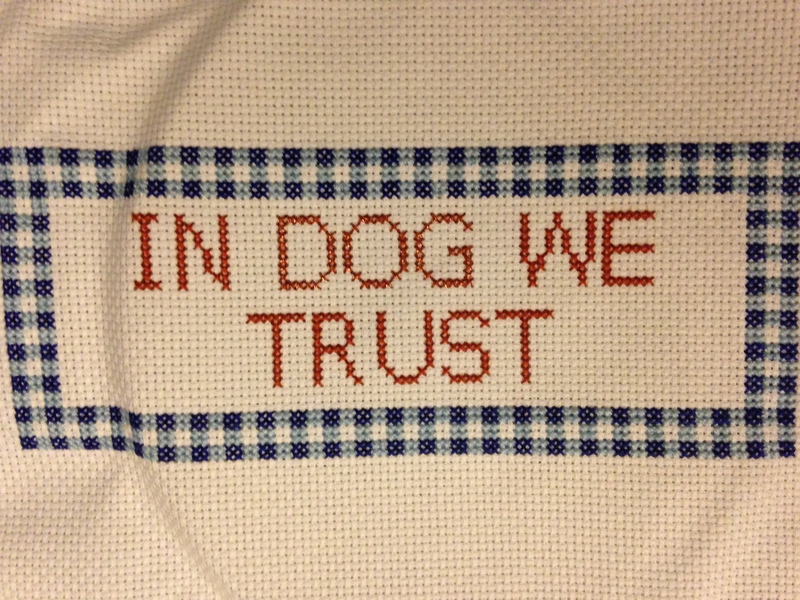 I finally finished my super secret cross-stitch project. Today I was mounting it on foam core so that I can ship it off to my friends, and Matagot decided to help me. 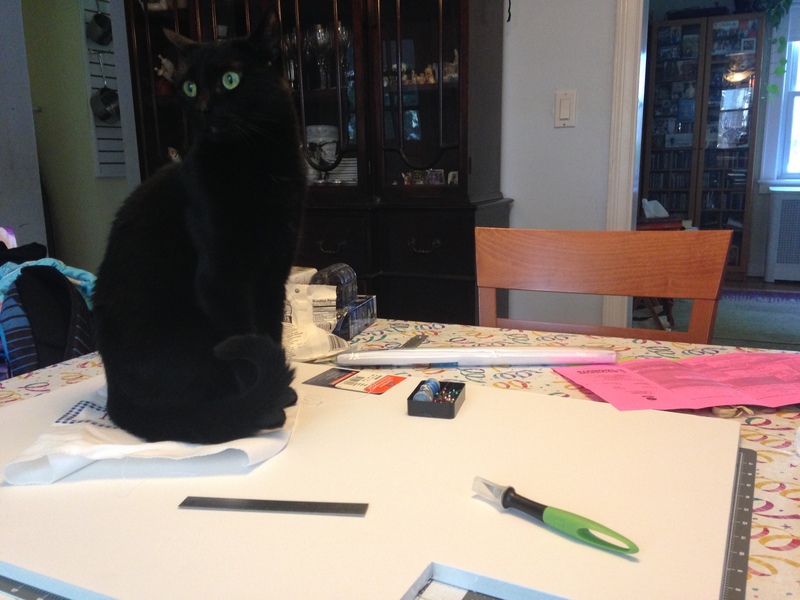 As you can see, she found the most helpful place to sit, on top of the foam core so I couldn’t move it AND on top of my finished cross stitch so I couldn’t measure it. Somehow, though, the project got done, and it ships out tomorrow. (I have a nice blistery burn on my thumb from the hot glue gun to prove it!) I will post photos as soon as I know it has reached its intended recipients, so that I won’t ruin the surprise. As I got ready to start my secret cross stitch project, I found myself needing embroidery floss during a snowstorm. I was ordering some online when I realized that my floss collection was becoming quite a mess. 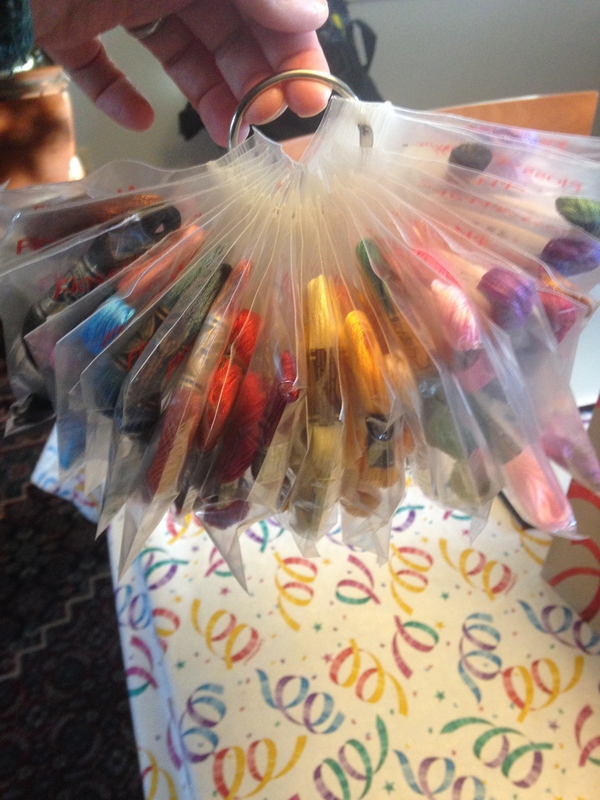 I started to research ways to organize floss, and I came across Floss A Way bags. They are the best thing ever. I now have my floss organized on two rings–one for the project I’m currently working on, and one with all the rest of my floss. Look at all the organization! So, I got to order stuff on the internet, organize it in numerical order (of course) label everything, and then take some of it to make a secret craft project. Happy nerd is happy!